Our goal is to create a realistic and immersive environment that people can explore using a virtual reality machine. To accomplish this we are using the CryENGINE and the Oculus Rift (virtual reality machine) to create and explore this environment. We decided to go with CryENGINE because of the detailed environments that can be created with it, and we chose the Rift because we want everyone who plays our game to feel fully immersed in the environment we create. Initially we thought that we would just be doing a lot of coding in CryENGINE, but over the past three weeks we realized that this project would require a lot more than coding, and for us to use more than just CryENGINE. Our first task was to determine the map layout, which we we were a little too ambitious about at first. We wanted our map to be diverse, with different sections that reflect different environmental conditions. Our original idea was to have the four corners of the map be a different kind of environment and have a floating lake in the middle of the map. The environments we planned on having were a tundra, tropical forest, desert, and a grassland. We began tinkering in CryENGINE and soon realized that the scope of our map was way too big (the lake idea was dropped quickly). Our plan is to make the map as detailed as it can be, but applying that level of detail to four distinctly different environments would probably take us until next April. The problem is less the amount of time it takes to make the environment and more the amount of time we have until we go our separate ways. We decided to choose a specific habitat that is diverse in plant life and animal life. We also needed to make sure that habitat had tigers, because tigers are just awesome. A boreal forest (taiga) was what we decided upon because it has elements of a grassland, tundra, and it has tigers. Also, boreal forests have diverse trees and plant life. CryENGINE gives you the tools to make a great looking environments, and makes it easy too. Unfortunately it takes more than just tools to create something. We needed to visualize how we wanted our environment to look and then build it in CryENGINE. This was difficult for us because we did not have a good idea of how a taiga should look. To understand more about taiga’s we researched the biomes plant and animal life. Through our research we found the necessary plants and animals to put in CryENGINE, but we still did not know the typical geographical layout of a taiga. Luckily, we noticed something in CryENGINE that made our lives much easier: the engine interprets a grayscale height map, so we went online and searched for height maps that represent a taiga. Although we found many height maps, they did not import very well into CryENGINE. The height maps that we found were not detailed enough so when we imported them the map was disproportionate and spiky looking. As we did more research on height maps we found a way to get a detailed looking map. We found a resource that allows you to take geographical data from Google Earth, translate it into a height map, and then import it into CryENGINE. This is useful because we can just take data from parts of the world that have taigas and create a map based on that data. CryENGINE provides you with a few plants and trees, but we can use very little of them for our environment. We went searching for resources online that could provide us with free vegetation that matches our environment. Unfortunately we could not find a free site, but we did find a site called xfrog that has everything we need. Xfrog has many diverse trees and plant life, and the best thing about it is that they put their vegetation into fairly priced bundles. We found three bundles that have everything we need to make an accurate and detailed taiga. This discovery took a few months off our project because we would have had to create the vegetation ourselves. This might be the most difficult part of our project. To create living characters we need to combine code with art. We need to create the characters, code for their behavior, and then create animations for them. Currently we are focused on creating all the animals that we want in our game. We decided to use a software called 3ds Max, which allows you to create and animate characters to import into CryENGINE. None of us know how to use this program, so we will be taking the next few months to become familiar with it while we work on the environment. Also, we downloaded a software called ZBrush which is a modeling software that we will use to make our animals more detailed. At first animating the animals sounded difficult, but one of our teachers showed us a resource that has free animations that we can apply to our characters. We are currently in the process of learning more about this resource. 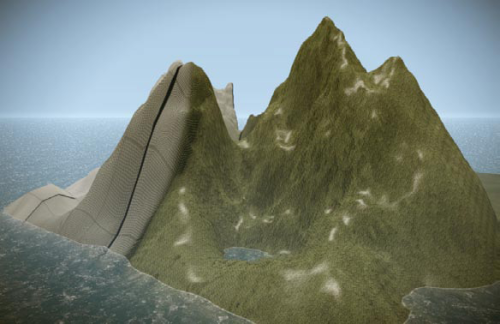 Experiment with World Machine (terrain creating software). Brainstorm about story and gameplay.